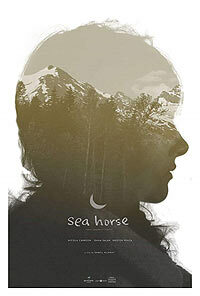 Sea Horse (2013) - Sci-fi-central.com. USA  2013  94m   Directed by: Kamell Allaway.  Starring: Valerie Brody, Nicola Carreon, Katy Dore, Kristen Penza, Dana Salah, Maxie Solters, Hannah Spool, Katie Wallack.  Music by: Tyler Westen. Three women struggle to survive in the Alaskan wilderness after a mysterious event has left them homeless. Along the way, they encounter other survivors who are out to help or hurt them, as well as a dangerous supernatural presence. It's not just that it's criminally boring, it's not just that the plot is like an incoherent fever dream, it's not just that it's lifeless and dull it's that all three of these things combined do not make for an entertaining movie. Upon reading the premise I was excited, when I saw the opening and witnessed the beauty of the Alaskan scenery I was engaged immediatly but it goes nowhere and goes nowhere really really slowly. I wanted to like this but the creators made it so very difficult to do so. I get what they were trying to do, it's not that I didn't understand the film. It just wasn't very good, and I'm quite surprised how well recieved it's been. Each to hisher own but for me this is one of the prettiest yet dullest films I've seen in years. In post apocalyptic worlds you can still find the means to keep your clothes looking like new. Review by Platypuschow from the Internet Movie Database.